Parenting can be tough—you have to be in charge of the cooking, cleaning, and making sure that the kids are ready for school on time. Luckily, there are ways to make life as a parent so much easier. If you use these 25 life-changing parenting hacks, not only will you need to put in less effort, but things around your house will run so much smoother. Your kids will be happier and cleaner, your house will be organized, and you won’t be worrying so much about where everything is or what needs to be done. Check them out and let us know which ones you’ve tried! Children love playing games, so it only makes sense to turn the things they don’t like doing into a game that they will actually enjoy. For example, if your kids made a huge mess with their toys, you can have them clean it up in a hurry by playing race against the clock with an egg timer. Sounds a bit too simple, doesn’t it? But, don’t knock the idea down until you’ve tried it first! 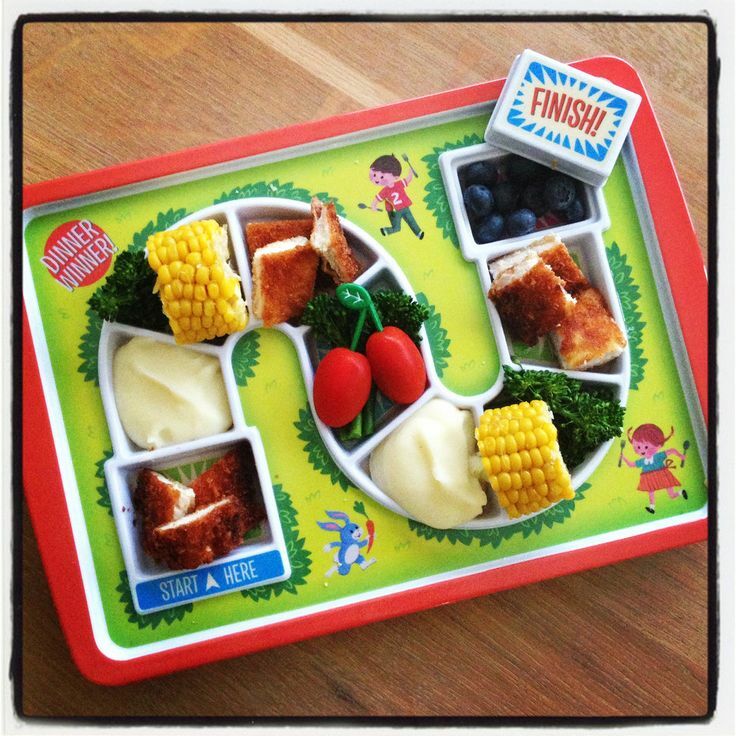 If your kids hate eating (especially if the food is healthy), turn mealtime into a game with this innovative Dinner Winner Kids Plate. It’s shaped like a board game so your kids will believe that they’re winning by eating it all. You can turn chores and other routines into a game as well. There are few things that make a child more miserable than having to constantly try on different pairs of shoes. 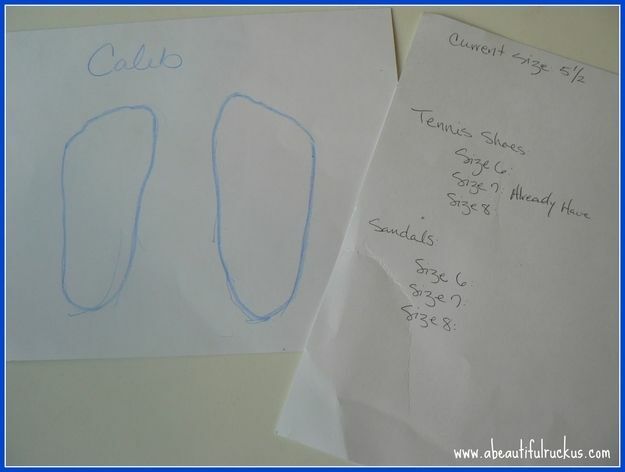 Instead of having to go through the hassle that comes with shoe shopping, simply trace your child’s feet onto a piece of paper (and maybe even measure it with a ruler) and bring it along with you in your purse the next time you go to the store. This way, you can show the store clerks the template and they’ll easily be able to pick out the right size for your child. This method is also very helpful if you happen to be walking around the city and see a limited-time shoe sale, but don’t have your child around to try them on. What a smart idea! Socks are the one clothing item that seem to vanish mysteriously every single time you do the laundry. Where do they go? You’ll never have to ask that question again or see your child in mismatched socks every morning if you follow these awesome tips. Gather all of your children’s dirty socks and wash them in a mesh laundry bag. This way, the soap can get into the bag and clean the socks, but they won’t disappear into a land far, far away. If you can’t find a mesh laundry bag, you can try keeping the socks together with binder clips or safety pins, as well. Finally, you can track socks down by creating a special area for lost socks. 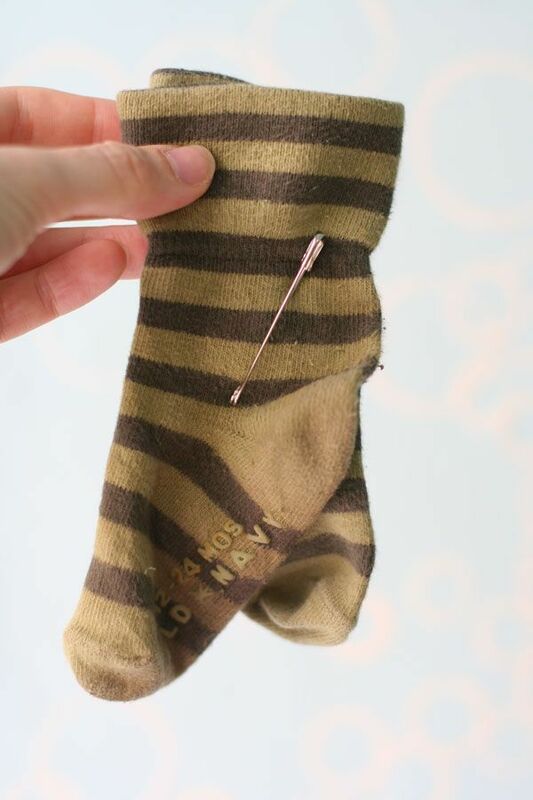 Each time you find a solo sock, put it in the “orphanage,” and hopefully it’ll be reunited with its other half one day. Cribs are expensive so instead of tossing your baby’s crib out when they outgrow it, upcycle it! In just a few easy steps, you can turn a crib into an awesome desk that your child can use to draw on, do their homework when the time comes and keep themselves entertained for hours. Not only will you be saving money, but you’ll also be reducing waste. Simply remove one of the sides of the crib, add a thick board cut to the size of the crib’s mattress, paint the board (using chalkboard paint is a great idea), and add hooks and suction hooks so that you can hang all the supplies they may need (such as scissors, storage containers for pencils, and more). See the complete instructions here. If you have more than one child and you’re taking them out for a trip to a place that’s crowded, we have a tip for you! Dress your children in matching outfits (it can be the exact outfit if they’re the same gender or the same color if they’re different genders) so that if they get lost, they’ll be easy to find. You can just tell people that you’re looking for another child wearing the exact outfit that your non-missing child is wearing. If your kids aren’t up for dressing alike or if you only have one child, you can also try writing your phone number on their arm. That way, if they can’t find you, they’ll know to use a phone to call you. Travelling with kids can be a hassle, especially if they constantly need a snack or entertainment. Instead of having to search through multiple packed bags while your child is screaming impatiently, keep everything in sight and within reach with a shoe organizer! This is such a brilliant and inexpensive idea! 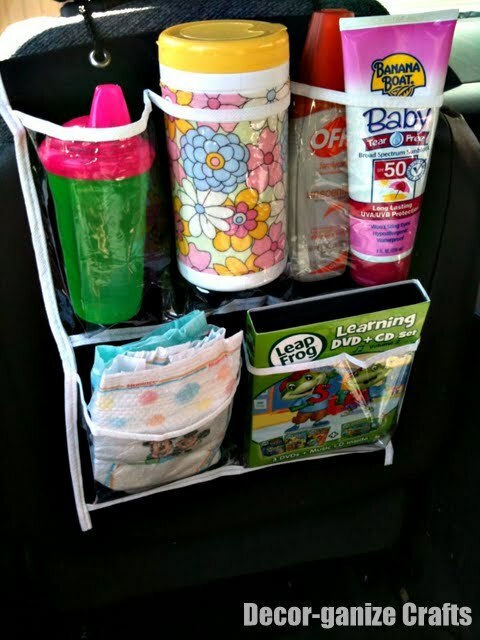 Things like diapers, a sippy cup, a small book or DVD, emergency supplies like bandages, and a small bag of chips can easily fit into the pockets of these organizers. The great thing about this is that it works for kids of all ages (you can put an iPad and headphones, pencils, a notepad and a travel guide of your destination in there for older kids). It’ll also keep your car tidy until you reach your destination. If you’re a thrifty parent with a child just as creative as you are, then you need to make this DVD coloring case. It’s basically an empty DVD case turned into an art kit, complete with paper and pencil crayons. The first step is to cut out the round part of the case where the DVD would normally go. Then, cut a sturdy piece of cardboard that fits into the right side of the DVD case. Next, decorate the cardboard using fabric and make a pocket to hold the pencil crayons. Finally, use spray adhesive to secure the cardboard onto the DVD case. Just add some paper to the left side and you have an entertained child. This is perfect for road trips and long waits at the doctor’s office! If your child constantly rolls off of their bed, it may be wise to add some protection around their bed. This is where pool noodles and fitted sheets come in handy! Simply add a pool noodle to each side of the bed (close to the ends) and wrap a fitted sheet around them to secure them into place. 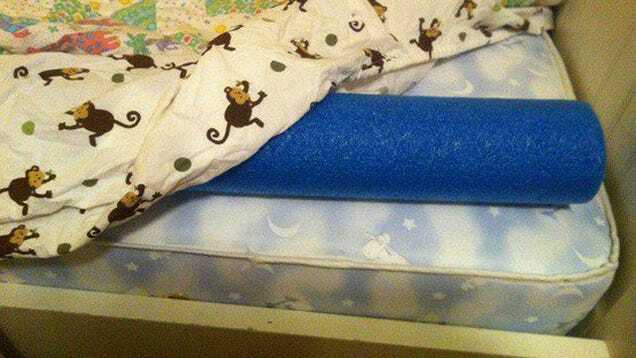 If you think that your kid will just roll right over that, you can try stacking a few pool noodles together and taping them (with duct tape) instead. The best part—besides the fact that they’ll save your kids from painful falls—is that they’re a super cheap alternative to bed rails! You can usually find pool noodles at the dollar store or department stores for under $3.00. Some sinks—usually washroom ones— have short faucets that make it difficult for your child to reach them. This results in your child either not washing their hands (yuck) or constantly calling someone for help. A stepping stool could solve this problem, but it’ll take up a lot of space in your washroom. To allow your child to be more independent, why not create a faucet extender? Sounds fancy and expensive, right? 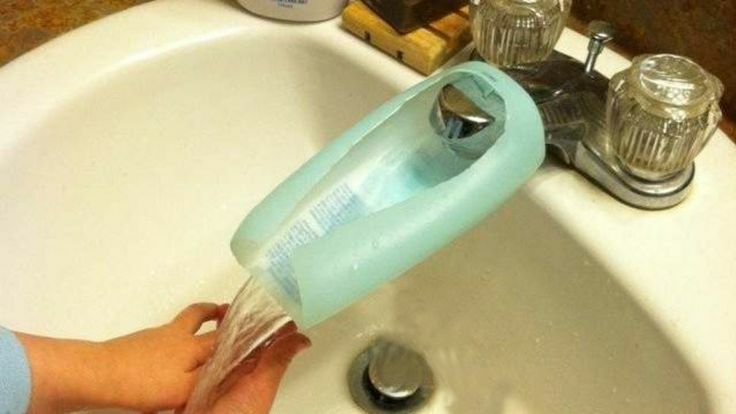 Well, it’s really just an empty lotion bottle cut so that it fits right onto the faucet, allowing water to flow further along into your child’s hands. Be sure to use sandpaper or steel wool to dull the sharp edges so that your kids won’t get hurt, though! You’re helping the environment by re-using and making your kid happy, at the same time! Pacifiers are like a miracle for some parents. So, of course, it makes sense to pack them wherever you go. But, just how should you pack a pacifier in a bag? After all, it has to go into your baby’s mouth so you want it to be as clean as possible. 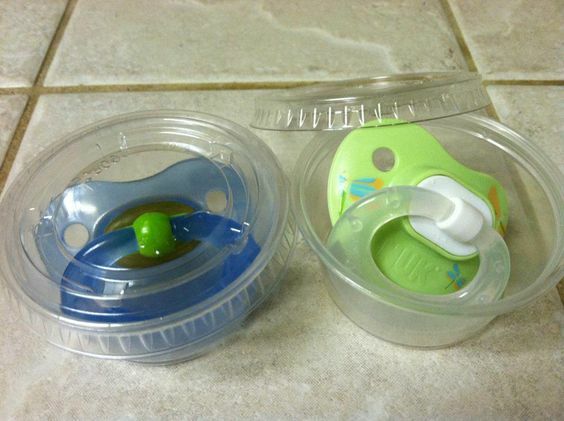 Coincidentally, sauce-to-go or cupcake containers hold pacifiers perfectly. You can grab these at the dollar store or at the grocery store for a dollar or two, at most. It’s a lot better than wrapping pacifiers in tissue (which can leave residue on them) or in zipped-top bags (which can get messy and wet fast). Alternatively, you can purchase a pacifier that already has a container attached to it. One great example is the Keep-it-Kleen pacifier, which has a lid that shuts if your baby drops it. Mornings can be hectic—especially if you have more than one child and they’re each involved in different after-school activities and sports. It’s easy to forget to pack the right supplies or equipment each day, but even if you do remember, sometimes your children may grab the wrong bag. To avoid any mishaps from happening during the morning rush, create an organized backpack station. Simply place hooks along the wall (preferably near the entrance to your house) for each child to hang their backpack on. Above each hook, mark the spot with their name or initial (you can get creative with this part). Also, add a dry-erase calendar or a bulletin board where you can write their schedules and list of materials that they need for the day, so they’ll never forget them again! Instead of dropping your hard-earned money on an expensive playpen that your baby will quickly outgrow, use an inflatable pool instead! There are so many reasons to opt for an inflatable pool playpen instead of a regular playpen. One is that it’ll allow your baby to remain active and explore a large area without getting hurt. Another is that because of the material it’s made from, it’s super easy to clean and it keeps the clutter contained. Finally, it can be used through all stages of your child’s life. While they’re still young, you can fill it with stuffed animals and their toys to keep them entertained for hours. When they’re a bit older, you can fill it with plastic balls to make an epic ball pit. And when they’re old enough to learn how to swim, you can move it out into the backyard and actually use it as a pool. Kids can be picky eaters; they won’t touch anything green, slimy, or healthy. You may be tempted to try out a fancy recipe you saw online in an attempt to get your kids to eat some fruits or veggies. But, before you spend all of that time cooking, try out this simple trick first: shape their food with cookie cutters. These days, cookie cutters come in all shapes and sizes. Pick up a few that you know your kid will enjoy and go crazy with it. Make octopus-shaped peanut butter sandwiches; try giving them heart-shaped slices of cheese; or how about flower-shaped cucumbers and pineapples? Your kid will most likely be so distracted by all the wonderful shapes on their plate that they’ll forget what they’re eating. You know the routine: you head into a mall with your little ones and they point out all of the toys that they want. Most of the time, they’ll get over the toys they pointed out by their next visit to the mall. But, sometimes, they’ll get so hooked on wanting a specific toy, that you never hear the end of it. How can we make our kids happy while keeping our bank accounts happy, too? Is that even possible? Well, one Parent Hacks reader had a great suggestion. When shopping with his child, he tells them to take a picture of the toy they repeatedly ask for and send it to Santa. This works because your child will think that they’re getting the toy eventually (and they just might, if their behavior is good), you won’t have to spend a fortune every time you step into a store, and you’ll have your Christmas shopping list ready to go by the time December rolls around. It’s great for little kids to enjoy their time playing outdoors and getting fresh air, whether it’s playing in a sandbox or just playing with their toys. But, having too much exposure to direct sunlight when they’re young isn’t good as it may lead to painful sunburns, increased risk of melanoma, and cataracts. 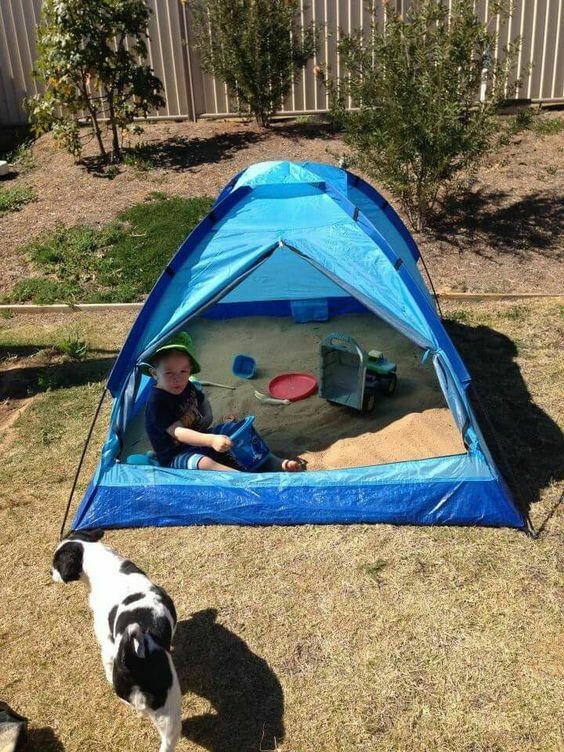 So, a great hack to keep in mind is to turn a small, old tent that you may have lying around into a shaded sandbox for your little one. That way, they can spend as many hours as they want building sandcastles without getting exposed to too much sunlight and you can close it up at night from preventing small animals or rain from ruining your child’s creations. Another great tip is to bring your child’s playpen outside and allow them to play as they normally would, but put a blanket over it to shade them from the sun and protect against pesky bugs. For many families, nothing takes up more time in the morning than choosing which outfits to wear and finding matching pairs of socks. It can be a real hassle, especially since you need to be out of the door by a specific time to make it to work, school, or daycare on time. One brilliant way to approach this problem is to prepare your child’s outfits for the entire week, ahead of time. Perhaps, it’s best to do this on a Sunday afternoon (when all the laundry is complete). You should check the weather for the week and definitely have your kid assist you since they’re the ones that have to wear these outfits. Once you have an outfit for each day, pack them into a plastic chest of drawers, and label each drawer with a day of the week. Problem solved! You may have child safety gates to prevent your baby from going into certain rooms, but sometimes, they just need to be in the living or dining room, which may mean that they’re also around furniture with sharp edges or doors that can squeeze their little fingers. Instead of buying expensive edge and corner guards, you can create your own (in practically no time at all) with pool noodles from the dollar store. Simply split a pool noodle down the middle, so that it can latch onto the edge of a door. Now, your child won’t squeeze their fingers or lock themselves in the room! 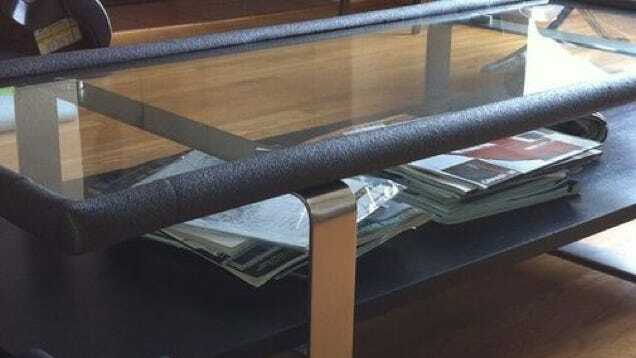 You can also do the same thing to protect your child from coffee tables, television stands, or any other furniture with sharp edges. How many times have you gone to the store with your child only to have them beg you to buy a Frozen plate or a Spiderman cup? Usually, these products are ridiculously overpriced (i.e. 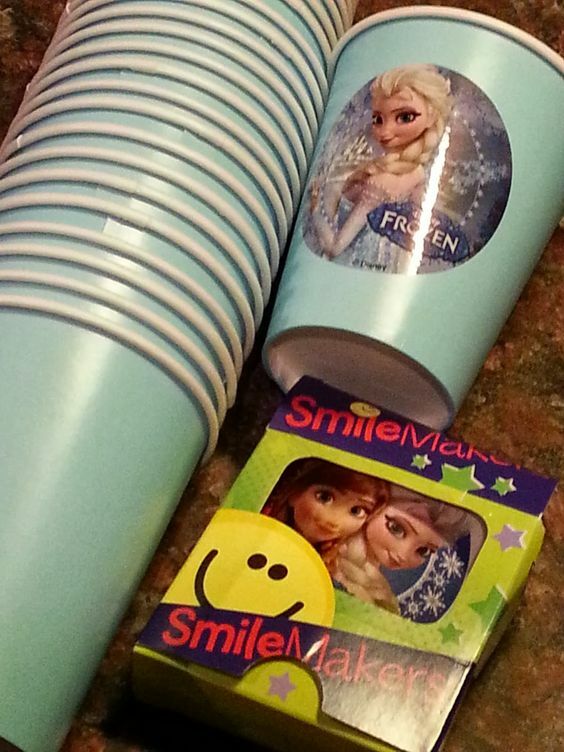 $9.00 for a flimsy plastic cup with a princess on it). So, one amazing way to stop spending a fortune on themed products, which your kids will probably get over in a few days, is to buy generic products and packages of themed stickers. For example, you can buy plain plastic cups and plates, plain pencil cases, plain notebooks etc. from the dollar store. Then, buy princess-themed stickers or Spiderman stickers (or whatever your child is into) and decorate the generic items with these stickers. Your child won’t be able to tell the difference and you’ll save a ton of money! Kids love popsicles—they’re sweet and keep kids cool when the weather is warm. But, the warm weather also makes popsicles melt quickly, leading to a huge mess on your child’s clothes and fingers. You may suggest that they keep the wrapper on to prevent this, but often, the wrapper gets ripped when opening the popsicle or your child just rips it off in frustration because they get in the way (and on top of that, the residue from the popsicles make them sticky). Also, if you make homemade popsicles, there are no wrappers. So, how do you prevent a sticky mess from occurring? 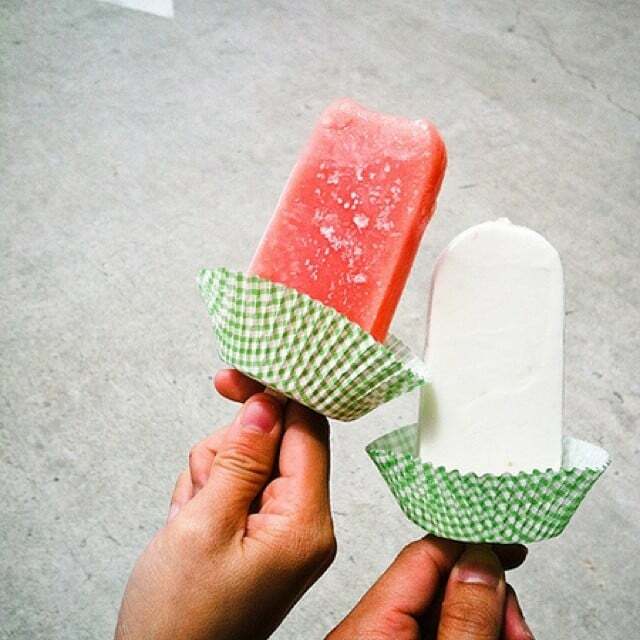 Try using a standard cupcake liner around the base of the popsicle to catch those messy drips. You’ll keep their hands, their clothes, and the floors clean. It’s often hard to get a child to stick to a routine. But it’s important that they learn this early, especially as they begin school. Not only will it help them with adjusting to a school schedule, but it will also set a foundation for them to be disciplined as they get older and eventually head into the work field. 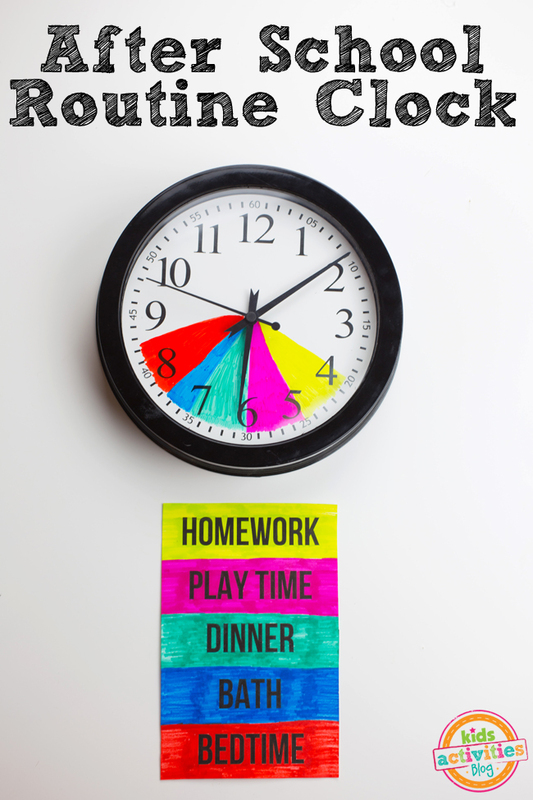 To help your kids learn the concept of time, create a color-coded list of activities that they need to do (for example, homework, shower, dinner, play, bed). Then, get a wall clock which has a back that you can easily remove. Shade in each section around the clock with the color that corresponds to each activity. Then, hang the clock up on the wall near the list of activities so that your kids will know what to do during each time block. Children grow so quickly that you’ll find yourself buying new pairs of shoes every couple of months. This can get a bit pricey, especially if you want shoes with grips on them to keep your child from slipping all over the place. One inexpensive hack that you can try is using a glue gun to add straight lines or dots on the bottom of your child’s shoes. Once it dries, you child will be able to run about and you won’t have to worry about them falling. You can also use this method to mark your child’s shoes (so that they won’t get mixed up with other children’s shoes) by using the glue gun to write their name on the bottom of their shoes. If you have a baby that’s just learning to walk, you can add grips to their socks as well! It can be a real hassle to get your kids to do their chores. Luckily, some crafty moms came up with an amazing way to get kids to do their chores (and it may even leave them begging you to do more). Simply label one jar as “chore jar” and add craft or popsicle sticks with a chore written on each (for example, wash dishes, pick up toys, etc.). Then, for each of your children, label a jar with their name on it. 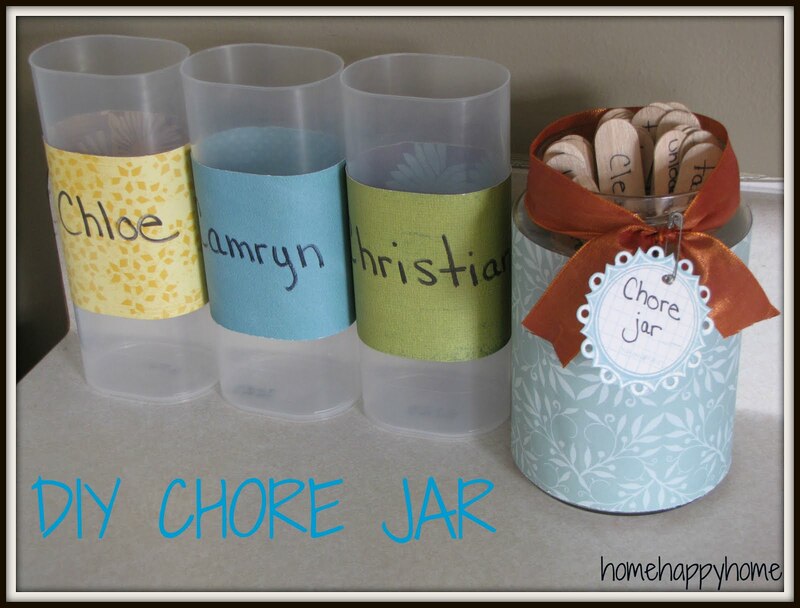 Once each child picks a chore from the “chore jar” selection and completes it, they can add it into their jar. At the end of each day or week (it’s up to you), they can redeem their chore sticks for a reward. Again, it’s up to you what the rewards are, but let them know in advance by writing it down. You may want to have one chore stick be redeemable for 50 cents or ten chore sticks be redeemable for a trip to the zoo. 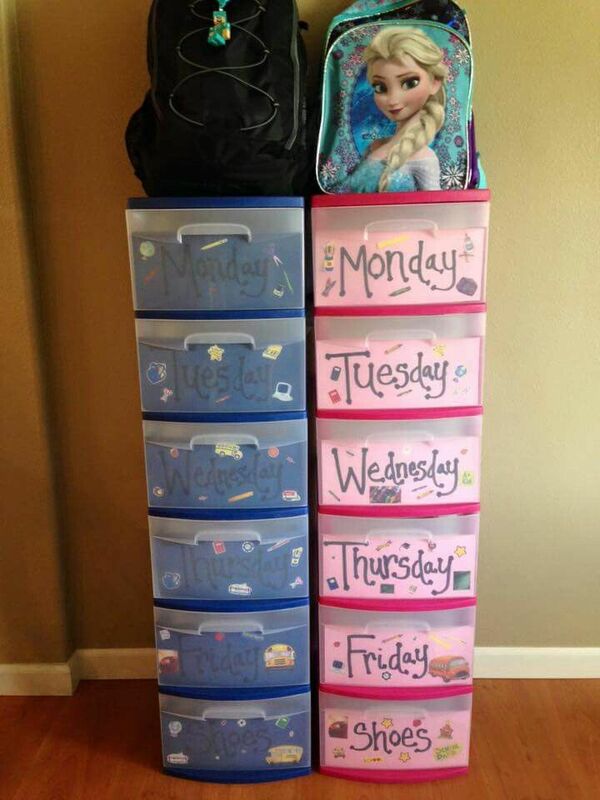 Besides using the color-coded clock method, there’s another way to get your child into a routine. 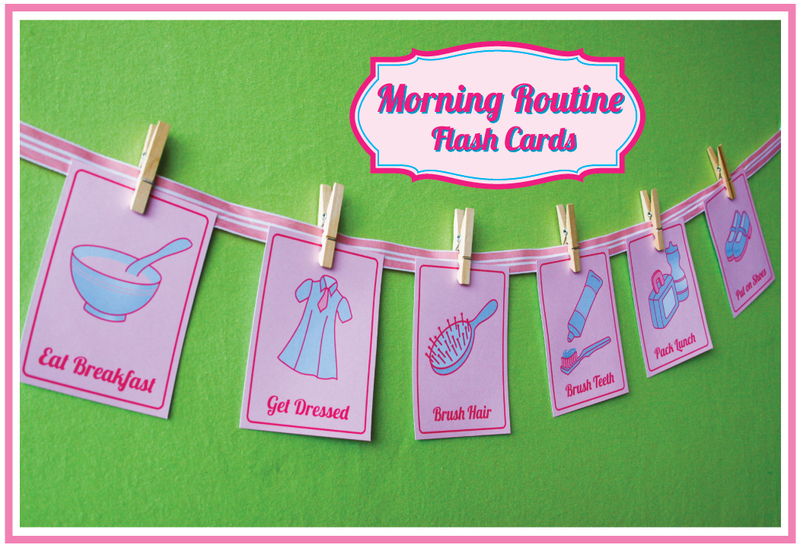 This one works best for younger kids who have morning routines where multiple things need to be done. Simply cut a few pieces of paper into rectangles and write or draw one step of your child’s morning routine on each piece of paper. For example, you can have flashcards that say, “Brush teeth,” “Eat breakfast,” “Get dressed,” “Brush Hair,” “Pack lunch” and so on. Put them in order and hang them up on your child’s bedroom wall using a piece of string and some clothes pins. If you put it low enough, they can even take each card off as they complete the task so that they’ll remember which to do next. Kids love marshmallow and now you will, too! Marshmallows can save you the trouble of cleaning up after your child when they’re eating an ice cream cone. How? 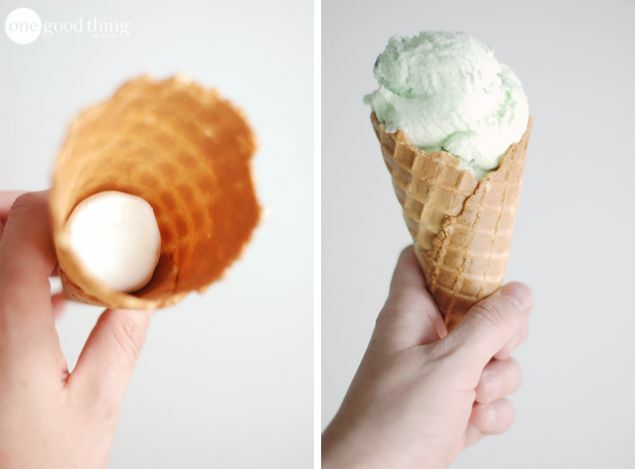 Simply place a mini marshmallow inside an ice cream cone before you scoop ice cream into it. This way, the ice cream won’t soften the end tip of the cone, leading to leakage. And your child will find a sweet surprise at the bottom of their cone. Wish you thought of that sooner, didn’t you? You can also use marshmallows to make your little one feel better after they’ve injured themselves. And no, we don’t mean just giving them some to eat (although, that might work just as well). Simply place some marshmallows in a zipped-top bag and freeze it for your kids to use as an ice pack. They’re way less messy than ice and softer, too. Some parents seem to have it all figured out. 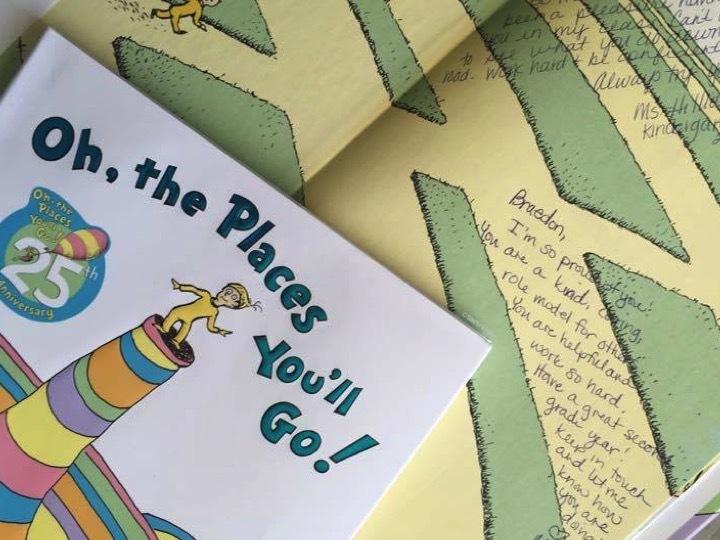 Like one father who presented his daughter with the most heartwarming high school graduation gift: a copy of Dr. Seuss’ Oh, The Places You’ll Go! book, signed by every teacher she’s ever had since she started school. How thoughtful is that? Ideas like these require planning ahead of time (you don’t want to end up running around the country like a lunatic looking for all of your child’s past teachers the month before they graduate). Another great idea is to take a picture of them in a t-shirt signifying their graduation (for example, “Class of 2036”) each year of their life. On their graduation, you’ll have an adorable slideshow to show off to your family and their friends. So, decide what thoughtful and creative gift you want to give to your child in the future and start collecting the photos, notes, and other memorabilia now.